The structure of the essay is as follows. First section is the summary of Biblical creation story. Here we establish the peaceful and herbivore nature of original natural world. We also establish that after the Curse many animals became carnivores and the world transformed into the state we find it today – violent and cruel. In the Section 2 we pose several important questions about the behavioral and anatomical changes that must have occurred in the world and who/what caused them; these questions are the subject of discussion of the subsequent sections. In Section 2 we also attempt to discuss these questions from the point of view of traditional church. Section 3 provides an overview of differences between herbivore and carnivore animal and highlights the difference between the two on anatomical level. Section 4 describes some predation adaptations found in modern natural world. It emphasizes the harming nature of these adaptations and points out the complexity of their design. Finally Section 5 returns to the questions raised in section 2 in particular to the question of the identity of the master mind and designer of the cruel world. In accord with the Biblical creation story we narrow down answers to three options and reach logical contradiction on all three of them. Genesis creation narrative is one of the corner stones of the Christian faith. Creation story is essential for defining and understanding the Fall of Man – one of the central doctrines of the Bible. New Testament, book of Romans in particular, uses the event as an argument for the necessity of Salvation. Apostle Paul draws a parallel between the Fall of Man due to one –Adam and the salvation of the world due to one – Jesus Christ. This essay takes a close look at issues that flow out of the Creation and Fall of Man Biblical narratives. We look at the routinely overlooked problem that the original creation and the creation after the Fall of Man are very different – not just in behavior but more importantly on anatomical level. The logical conclusion follows that if Bible is to be trusted on creation and Fall of Man account then God must be the designer of the corrupt and evil world we live in today. In the course of discussion we base all arguments on the conservative literary interpretation of the Bible. As we see the biblical world before the Fall of Man was indeed good. It was also quite different from the world we live in today. One of the main differences between then and now was the absence of death and bloodshed. Natural world lived in harmony as both animals as well as humans consumed plants as food and did not cause harm to one another. Genesis 9:3 reaffirms the above point and leaves no doubt that originally all living world was solely herbivores. The sin Adam and Eve committed by disobeying God, lead to consequences for the whole living world of mega catastrophic proportions. First people, then animals turned against each other and the cruelty and disease entered natural world. Previously peaceful lions that nourished on grass only started preying on deer, killed and devoured gazelle. Almost every living animal became a predator or prey. The suffering has entered the world. As apostle Paul writes: “We know that the whole creation has been groaning as in the pains of childbirth right up to the present time.”Romans 8:22. The sin that entered the world caused havoc, instilled cruelty and brought suffering not only to people but to the whole natural world. But how exactly did this evil happen to the world? What caused animals to kill one another and how were they able to change their plant eating behavior and consume flesh? How did predation devices such as poison to kill prey and many others, which were incompatible with the original design, appear after the Fall of Man? The Bible (and church) do not go in much detail to answer such questions and provide only general ideas. Killing behavior has been most likely contributed to the corruption of the will or “morals” of the animals. If Adam’s sin was the cause for corrupting human morals and desires the same corruption of will must has spread among the natural world. Although this is not testable in any way, such reasoning can be acceptable on the grounds of “invisibility” of will (motivation) and also because it logically follows from the spread of corrupted will among humans. The question can also be tackled from the standpoint of the Entropy law. It is generally true that systems naturally deteriorate when left without supervision. Thus the originally perfect world didn’t require much effort to make it deteriorate. As soon as sin entered the world and God’s sustaining power was withheld things naturally fell in decay. The second question of how the previously herbivorous animals switched from plant diet to meat diet is more subtle. The topic of the question is not preached on in traditional churches nor is it discussed in Sunday Schools or Bible studies. In fact few believing people have given it a thought. The problem (if it was perceived as such) was likely dispensed with by “the evil caused it” semi-circular argument or more likely was left to not be bothered with as it “does not directly pertain to salvation”. Such attitudes, quite common indeed, are understandable in the age when people were ignorant about natural world. In the modern world when we have substantial information and can cross examine stories with science it is reasonable to ask questions. The question about what or who caused animals to develop sophisticated defense and attack mechanisms (such as venom in cobra) must have not been discusses in church at all. For the same reason as above, believers tend not to notice the question of this character. When they do think about such questions they always put faith before reason and when reason and faith do not coincide they sacrifice reason in favor of blind belief. To simplify my task of referring to different sources this section will consist primarily of “copy and paste” with links provided where quoted. The information also is of general knowledge and can be verified at any reputable source. The most obvious indication is the teeth. Herbivores are animals that have broad, flat canines, that are shaped in the form of spades, and short, dull incisors. This allows them to properly grind the fibers found in plants, and crush seeds and grains, consumed during their lifetime. On the other hand, carnivores have short, pointed canines, and long, sharp, curved incisors. This allows them to tear through skin, muscle and ligaments, and help them chew the meat from their prey . A carnivore's or omnivore's small intestine is three to six times the length of its trunk. This is a tool designed for rapid elimination of food that rots quickly. Man's, as well as other herbivore's small intestines are 10 to 12 times the length of their body, and winds itself back and forth in random directions. This is a tool designed for keeping food in it for long enough periods of time so that all the valuable nutrients and minerals can be extracted from it before it enters the large intestine. A carnivore's or omnivore's large intestine is relatively short and simple, like a pipe. This passage is also relatively smooth and runs fairly straight so that fatty wastes high in cholesterol can easily slide out before they start to putrefy. Man's, as well as other herbivore's large intestines, or colons, are puckered and pouched, an apparatus that runs in three directions (ascending, traversing and descending), designed to hold wastes that originally were foods high in water content. This is so that the fluids can be extracted from these wastes, now that all the useful nutrients and minerals have been extracted and the long journey through the small intestine is over. Substances high in fat and cholesterol that have been putrefying for hours during their long stay in the small intestine tend to get stuck in the pockets that line the large intestine. The above excerpts give one understanding and appreciation of the very significant difference in the skeleton structure and digestive system of herbivore and carnivore animal. Next we are going to look at animal and plant systems that are specifically meant to kill and cause violence. The motivation for this should be clear: notion of predation adaptations is incompatible with original design and thus they must have appeared after the Fall of Man. We want to better understand the adaptations so we can better judge their origin. Nature has countless examples of animal and plant predation adaptations that allow animals and plants to prey and help avoid their predators. These adaptations appear to be built in into the nature and are often so complex that they defy imagination. The number of adaptations is so huge and varied that describing them all, let alone listing detailed examples would fill volumes. The point here is that they are a) extremely complex and non random and b) animals/plants that own them have them exactly to kill other animals/plants or protect themselves from being killed. Strong powerful body skeleton, jaws and teeth for gripping and crushing victim. Adult American alligator bite was measured to be 2,215 pounds of force. This is equivalent to tying a pickup truck and trying to hold on to a rope after dropping the truck from a roof of a tall building. This bite force is necessary for the alligator to hold on to it's trapped prey, like a deer or bull, but does not make much sense for eating plants. Besides cobra and other venomous snakes countless other animals and plants possess an ability to poison and tranquilize their victims when secreting complex chemical compounds that kill without harming the predator itself. Comodo dragon for example is a large lizard that hunts on deer thanks to it's venomous bite. While the lizard cannot tackle deer directly by force, one poisonous bite is sufficient to guarantee a dinner next day when the poisoned animal dies. Stomachs of alligator is known to digest anything from their victims – bones, feather, horns. Hyena's and other predators likewise can digest bones. Again, the question is why would these animals that originally nourished on plants need bone-digesting stomachs. Asian pitcher plant uses a deception technique. It's bright red color and the seed in the shape of a pitcher attract insects looking to collect nectar. The pitcher plant then traps a victim within pitcher and slowly digests it over few days. Camouflage consists not only of color but also of shape and texture. Praying mantis dead-leaf-like appearance, zebra stripes are examples of camouflage, vulnerable drone fly looking like a stinging bee is an example of mimicry. Another example of mimicry is IO moth which has markings on its wings resembling an owl's eyes. Other examples of anti-predator adaptations are deceptive aggression, social mobbing behavior, advertizing unprofitably and chemical defense. In the light of the above discussion we have substantiated the big gap there is between the original world God created and the world it became after the Fall of Man. On the surface it might seem that the natural world simply slipped below the initial mark of perfection as animals and plants abolished peaceful coexistence and turned on each other in cruel violence. On the more close looking however we find that the resultant world is abounding in the adaptations that marvel us in complexity, ingenuity and we could say wisdom. Although radically different in purpose – killing and surviving as opposed to peaceful coexistence – these necessary and radical changes in the anatomy and possibly structure of animals and plants after the Fall of Man instill amazement and evoke a sense of awe. The argument from Entropy that we saw in Section 2 to explain away the appearance of violence clearly does not stand ground. And so we must ask the obvious question. Who was the master mind and the changing force in the transition of nature from original state of creation to the state of today? Who has re engineered the long intestine of a lion and of all other now carnivores that was originally necessary for the digestion of grass into much shorter one that is now specialized in digesting animal flesh? Who has increased the acidity of the alligator to the potent levels of today. Who was behind the development of various ingenious poisoning systems that venomous snakes, toxic jellyfishes and deadly spiders possess? Who has designed the carnivorous plants, perfected their deception mechanisms and supplied them with animal digesting juices? Unfortunately for creationism, this cannot be, or it means accepting evolution. One could suggest micro evolution perhaps, as that is acceptable with most creationists views. When micro evolution could possibly produce camouflage or mimicry, it could not redesign digestive organs of animals. Nor could it develop complex poisonous mechanisms. Another question would be how many millions of years would it take to accomplish say carnivores behavior. Wait, Bible is not talking of millions of years. Contradiction. The only contender to God the devil is a possible candidate for equipping the nature for killing. In this case we must give Satan a lot of credit for being ingenious even god like as the above mentioned adaptations require a brilliant designer. But Satan possibly could be up to the task, we don't know, after all he managed to take a third of angels with him and he is capable of miraculous powers. The problem with this theory is that we must accept that the nature is a product of both God and Satan. More importantly humans had to learn to eat meat, and their digestive systems must have been modified in some way by Satan. We know that Jesus ate fish and of course he ate meat too. Are we to believe that Jesus had a body that was worked on by Satan? Somehow this doesn't go well with the Bible. Contradiction. It must be apparent that God is our only choice and also it must be clear that we have reached a logical contradiction. The good loving God can design a world that is good. The good and loving God can even allow the world rebel against him and watch passively as it falls into disarray. But the good and loving God cannot actively participate in creating a violent cruel and murderous world. And that's exactly what happens if we accept this option. Contradiction. For centuries people accepted the Biblical account of creation without questioning it. Little information was known about the natural world. 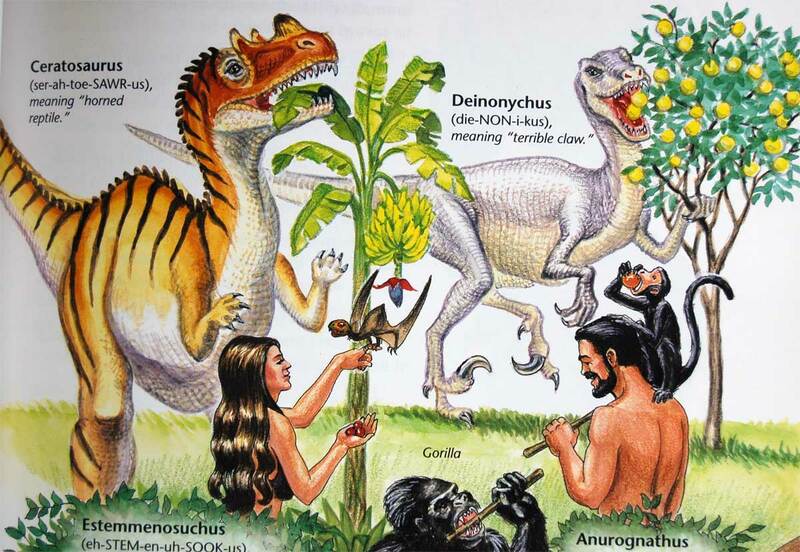 The herbivores and carnivores seemed to have little differences except that former don't eat meat while later do. The violence observed in the nature also seemed random, stemming from the will of the animals, and the complexity of predation adaptations was not well known and not well appreciated. The science has progressed enormously since those times and we can judge about things we couldn't in the past. If the Bible is true it must align with science perfectly and it must make sense. It has to make better sense the more science we know. In this essay relatively simple scientific knowledge was applied to the Biblical story of creation and the Fall of Man. In the process we reached a logical contradiction. Given the literal interpretation of creation story we have to believe that God was the master mind and creator of cruelty. But that cannot be because He is a God of love and cannot do evil! We reached a contradiction that casts a long shadow of doubt on the Biblical creationism.